Microsoft spent a lot of time defending its decision to use a 1366 x 768 panel in the original Surface RT, all the while knowing its successor would move to the same 1080p panel as its bigger brother. With Surface 2 Microsoft thankfully embraces the importance of relatively high resolution displays in tablets. The 10.6-inch 1920 x 1080 display weighs in at just over 207 pixels per inch, which isn’t too far off rMBP standards although still shy of the iPad with Retina Display. 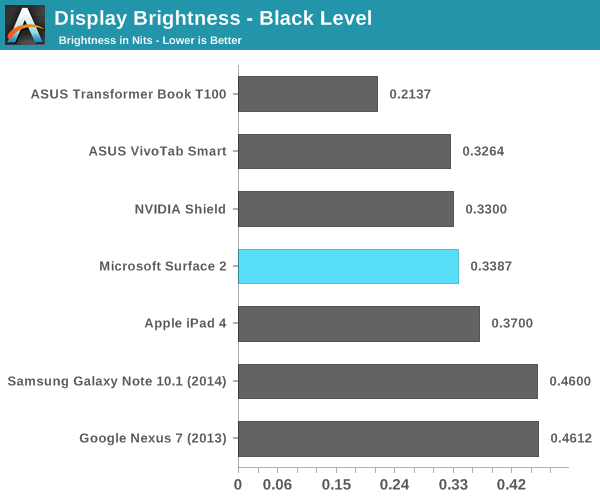 A higher resolution panel isn’t absolutely necessary here, and given the 64-bit memory interface of Tegra 4 (and its associated GPU power) I don’t know that we’d want something substantially higher in Surface 2. 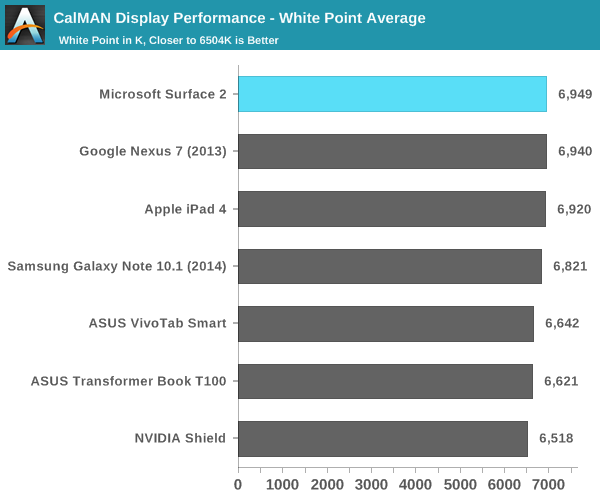 By default Surface 2 ships with 150% DPI scaling enabled, and for the most part it works well in the limited selection of classic desktop apps that ship on the machine. Since you can’t install third party classic desktop apps there’s no real chance for anything to go wrong on the DPI scaling front. 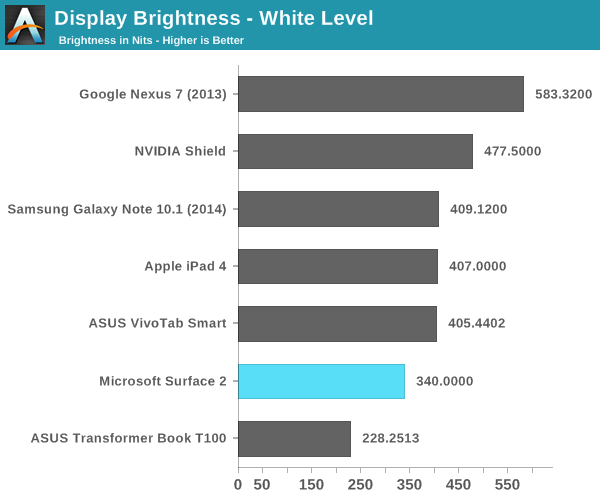 Color accuracy is much improved compared to Surface/Surface Pro. 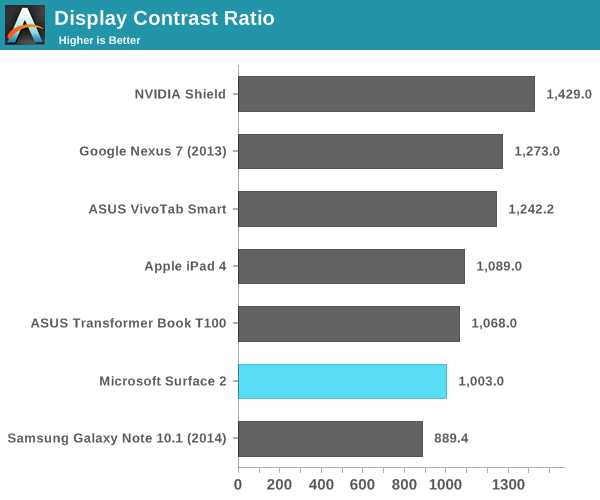 Microsoft openly admitted to not targeting full sRGB coverage at the Surface 2 launch event, which means that you’re not going to see Surface 2’s color accuracy equal that of the Nexus 7 or iPad with Retina Display. Subjectively the display looks very good, a huge improvement over last year’s model. 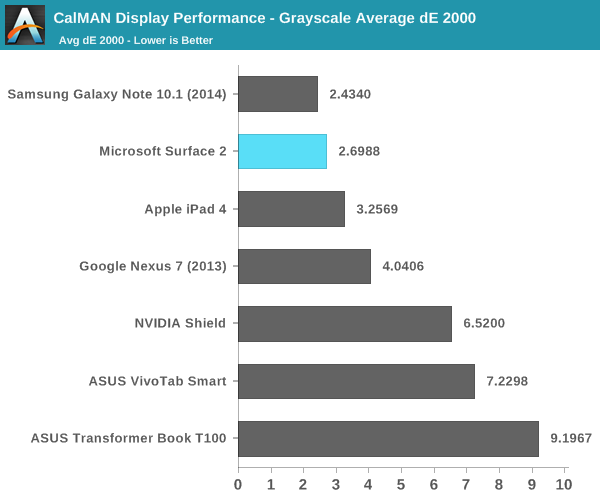 Grayscale accuracy is actually quite good, as is Surface 2’s performance in our GMB pattern test. 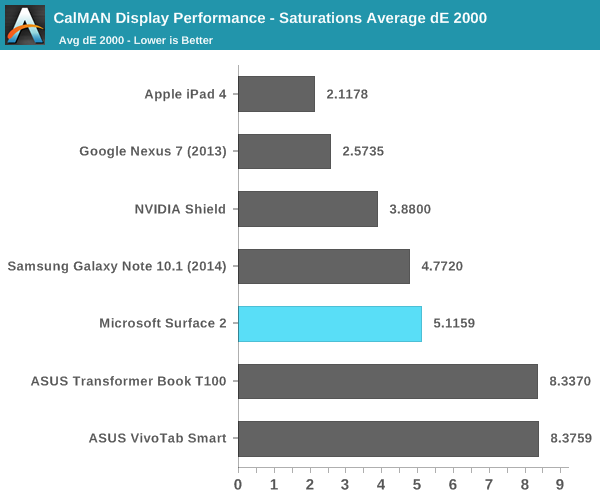 Measuring accuracy while we scale color saturation however has the Surface 2’s display falling short of the competition, and our basic gamut test doesn’t come out very strongly either. 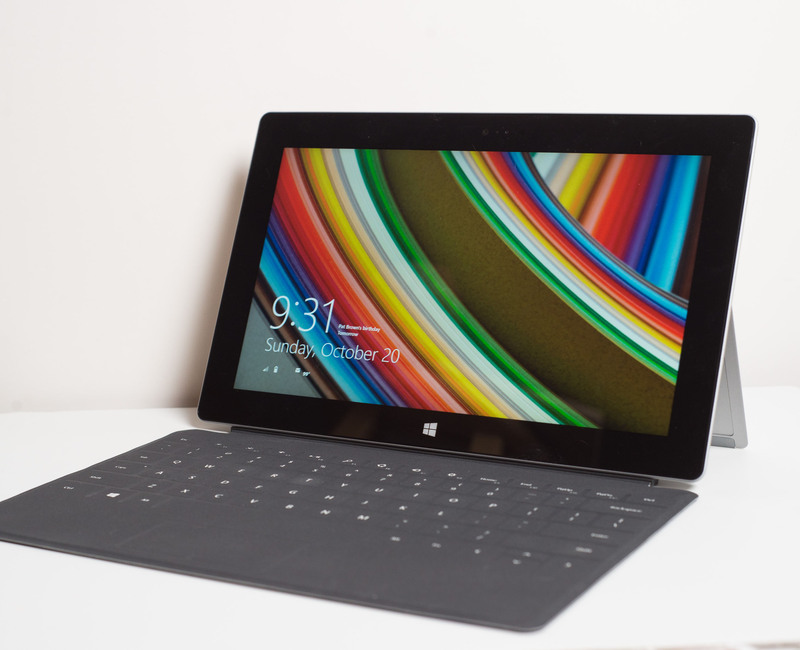 Microsoft continues to be proud of the fact that its Surface 2 (and Pro 2) displays are laminated to their cover glass to help reduce reflections. In practice I can say that this helps improve the overall experience while using the devices. 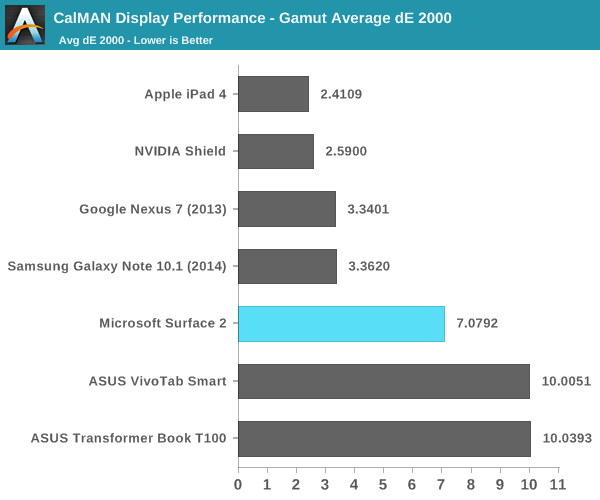 Overall display performance isn’t bad at all, and it’s an improvement over what Microsoft shipped last year, but it could definitely be better. 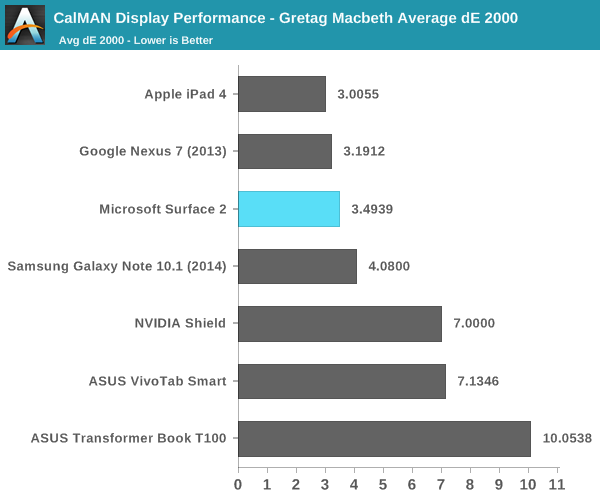 Google set the new bar with the $229 2013 Nexus 7’s display and all competitors really have to meet it at this point.